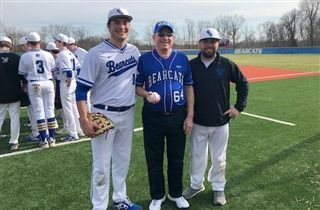 We were proud to welcome Mr. Lowry Watkins Jr., a 1964 graduate of KCD predecessor Aquinas Preparatory School, to throw out the first pitch at our varsity baseball season opener against Moore. Mr. Watkins is a generous KCD supporter who has made a lasting impact on this school over many years. In addition to establishing a student scholarship fund, Mr. Watkins has established endowments to benefit the tennis, baseball, and soccer programs, as well as the library. He was recognized with KCD’s Exceptional Service Award in 2011. Thanks to Mr. Lowry Watkins Jr. for his generosity and support!